This article is intended for those who want to reduce the possibility of abuse by staff and raise the level of control over the actions of employees, to limit the financial and material losses of the enterprise. In the area of ​​trade abuses of unscrupulous employees have always been of the magnitude, how often times higher than the damage from the theft committed by customers. Frauds occur throughout the chain of movement of goods - from receiving to storage to implementation over the counter. The objective in this case always the same - personal gain at the expense of the owner of the company or customers. Opportunities to use open office set. This may include manipulation of cash instruments (RMA, not made ​​through cash or fictitious, and not punched or canceled check), the machinations of discount. Opportune moment to steal an acceptance of goods (in stock accounts for a smaller quantity than specified in the bill of lading, etc.). The most effective means of preventing abuse is a division of the rights of users (divide et impera). The business owner has the ability to customize the level of access depending on the functional responsibilities and the degree of confidence to a particular employee store. This allows, first, to establish a minimum access to information. Users are granted only those rights and the data they need to perform their duties. The purpose of this principle is clear - to reduce damage from accidental or intentional incorrect actions. Second, to define responsibilities and authority under which employees will be responsible for their actions. Consider a few examples. Commodity shall decide on the purchase of certain goods and stores it in the system, performs quality control of incoming goods, and gives the nod to his reception, and monitors expiration dates and status of existing products. You can assign access rights to directories commodity group. Manager, based on data about the current stock of goods, the dynamics of their sales and price proposals from suppliers, orders forms and controls their execution. Therefore, interactive access to the warehouse manager documents shall be prohibited, but are allowed to read for information in the reports, as well as all rights to work with the orders. Also, certain staff may be engaged in inventories and find and correct errors committed by other users, and only he will have the right to edit the document after the fact. At TCU function separating the rights of users supported in the offices of the "Network" and "Ultra". Each user is assigned a login and password is assigned, under which it enters the system. Rights for users assigned to the card user (Directory -> Users). Priority right in the system has an administrator. That he may assign rights to other users, just enter the new ones. Only a user with administrator rights can access the "User Manuals". Initially, the system has a user with administrator rights - Korobeinikov SA with login 1. You can just change the username and full name, as well as assign a password. 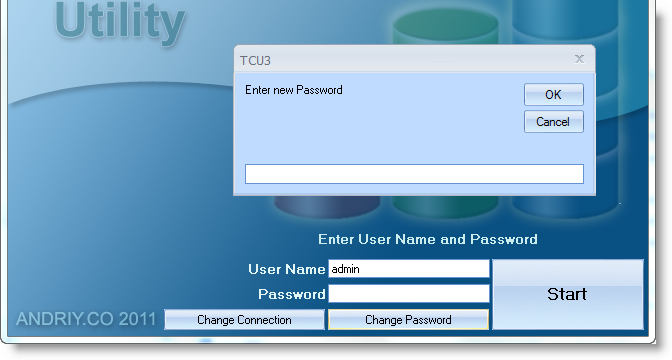 This can be done with login TCU in the welcome window by clicking the "Change Password". Likewise, set a password for other users. In the future each user can change the password. To do this, you must first enter into the field "Password" current password, then click the "Change Password". The card user has three tabs. Let us examine them in detail. Administrator - determines whether the user has administrator rights, ie the ability to edit all the manuals, installation control points, etc. Debt Write-Off - determines whether the user has the right to debt relief for clients. Edit Goods Directory - determines whether the user has the right to edit reference products, product groups, introduce new ones. Edit Clients Directory - determines whether the user has the right to edit reference customers, groups of customers, introduce new ones. Edit Article Directory - determines whether the user has the right to edit and input new entries. Edit Route List - determines whether the user has the right to edit and input new routes. 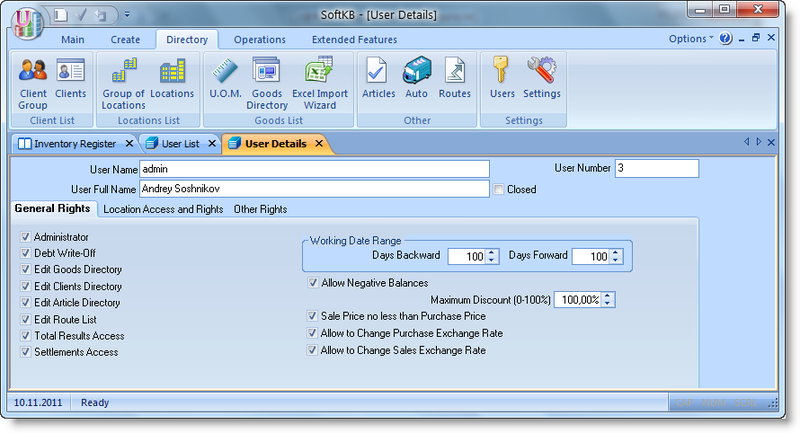 Allow Negative Balances - determines whether the operator is entitled to a leave of goods "in minus", ie ship goods that are in stock, accounting TCU or no missing numbers. Situation is possible in the case where the goods at the point of the provider arrived, but TCU did not get (not introduced or not approved by the Invoice). Maximum Discount % - determines whether the user has the right to leave the goods at a discount on the expenditure invoice. A value of 0.00% - not so entitled. Sale Price no less than Purchase Price - if the user is entitled to a discount, then this option determines whether the retail price after discounts fall below the purchase. Allow to Change Purchase Exchange Rate – determines whether the user has the right to approve the incoming invoice, if it is specified rate that is different from the system. Allow to Change Sales Exchange Rate – determines whether the user has the right to approve the expenditure invoice, if it is specified rate that is different from the system. There are situations where when you try to rollback selected from the list of documents invoice, the program displays a message: 227: Date of the document is outside the range of available dates. Tune shifts of dates produced in the card system user. 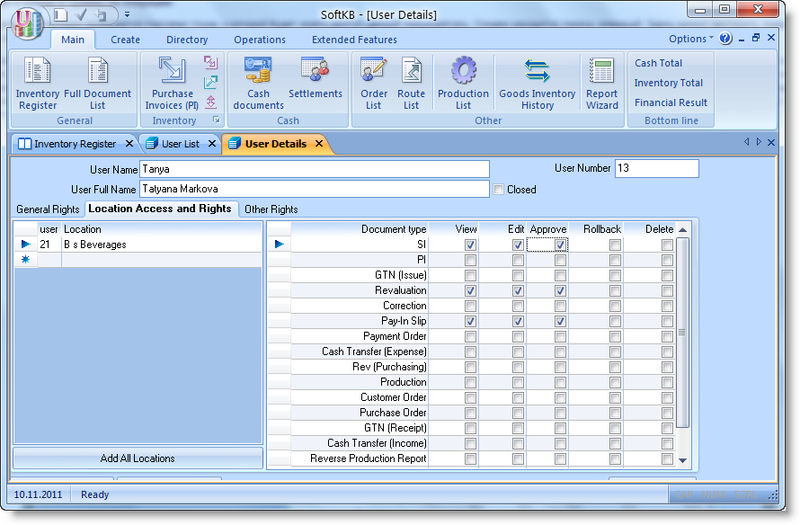 Working Date Range –determines the range of available dates during which the user allowed to edit documents. For example, to the cashier you can set the number of days back to 0. In this case, it will only have access to the Sales Invoice and cash orders, held today. On the left side of the tab is selected outlet, which will have access to the user. On the right is to thwart the operations. 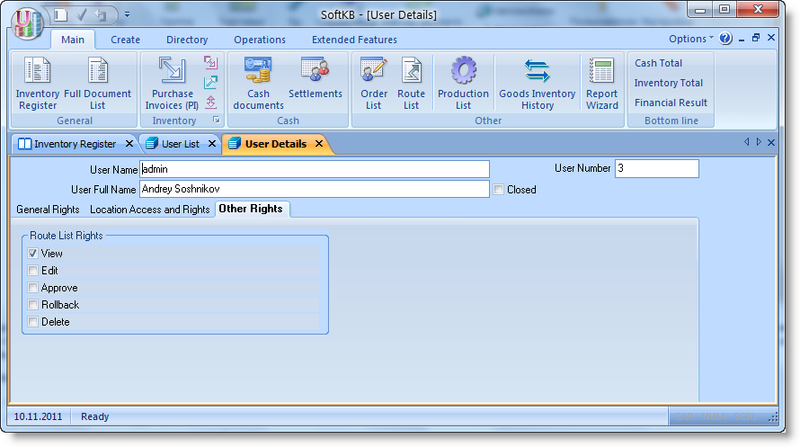 Here you can set access rights the current user to the selected point. Tatyana Markova user with a login Tanya is a cashier at the point of sale "B s Beverages". Her responsibilities include commissioning of the goods in the consignment, the amount of calculation and payment of the adoption of the invoice, delivery receipt, bring in and take money. Consequently, it must grant the right to view, edit, and wiring overhead expenditure and receipt of cash orders. Then, if the general rights for it shows the percentage of discount must be given the right to view, edit and re wiring acts. In the shops put the cursor on the line marked with an asterisk, and choose from the list needed a store - "B s Beverages". Set up the rights to the user Tanya. The administrator can keep the right to review all the points, as it does not work directly with the documents. To quickly add all the points of the system, click on "Add All Locations". Then click on the column header to the desired operation. 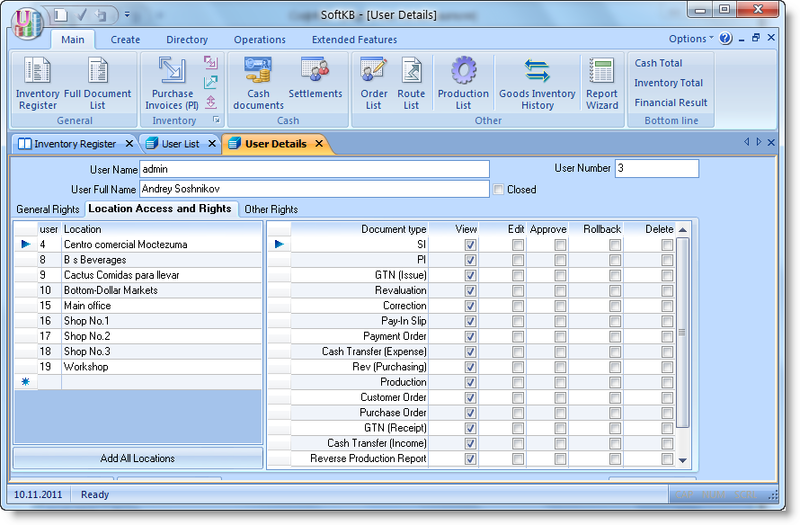 This will enable both check boxes for all types of documents to the selected point. From this tab, you should pay attention to one point. You enter into a new directory of retail outlet. Then back to the main form (Inventory Register of goods), it appears that the tree of shops and groups of products the new point is missing. This suggests that this point is not available for viewing. To access it in a card user to configure access to the necessary operations. In the "Route List Rights" is defined at the user's work with the route lists. Every action of a user is logged in the "Journal of the user's actions." At any given time can be set, by whom, at what time, what operation was performed. An employee who has committed abuse or mistake, there will always be installed. This significantly reduces the possibility of abuse by staff, and minimizes the need for external control. To summarize, the reader, which helps solve the problem of separating the function of human users. Division of labor organization personnel. Control of the actions of all users. In conclusion, we note that the panacea for the abuse does not exist. However, the role of an effective treatment of goods is very large, and the correct understanding and use of the opportunities offered by the accounting system, will provide powerful levers of control over the activities of the enterprise as a whole.